On Cathy's 50th birthday we "forced" her to buy some beautiful fabric, and then "twisted her arm" to include a companion fabric. She turn to me and lamented that she would never figure out what to do with it. I promised her right then that I'd design a quilt for her fabrics. The pieces are large to show off Cathy's beautiful print. The pattern is simple, two fabrics and a background. I made mine with a wonderful floral, a soft green and a tone on tone background. 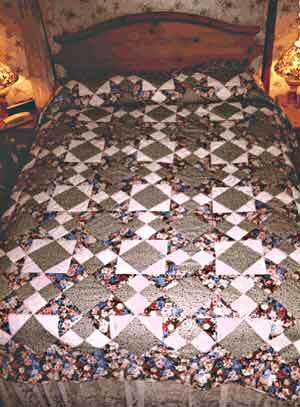 This is a very easy pattern, great for the beginning quilter. Because of the large pieces it works up quickly. The pattern includes directions for queen, twin and lap size.